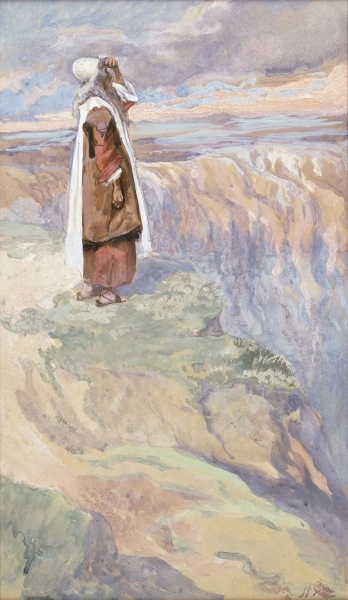 James J. Tissot, "Moses Sees the Promised Land from Afar" (1896-1900), Jewish Museum, New York. Larger image. 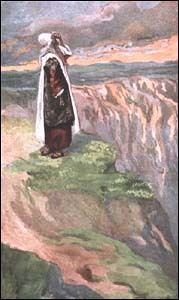 Moses is awe-inspiring. From a distance he is a grand and epic figure. But close up, he can be studied as a somewhat reluctant leader trying desperately to learn to lead under God's direction. In this 9-week study, I've chosen to study large parts of Exodus and Numbers in terms of Moses the follower of Yahweh and leader on His behalf, rather than as a history of the people of Israel. My focus will be on what we can learn from Moses as a man of faith and as a reluctant leader of God's people. You may be a church member and disciple. But, more likely than not, you're also a leader in your church, perhaps as a deacon or elder or pastor. As you take the time to look at Moses the man, you'll learn a lot that can benefit you in your ministry. Even as a seasoned-pastor myself, I am struggling to learn afresh the lessons that this 80-year-old, newly-minted leader was learning from God during his on-the-job training. This study is be presented as free, e-mail-delivered Bible study.